You have created mobile app and successfully added it to stores — what should the next steps be? How to compete for your users with other 2 386 125 applications in Google Play (according to AppBrain) and around the same number in App Store? Is there anything like SEO, but for mobile applications? Yes. 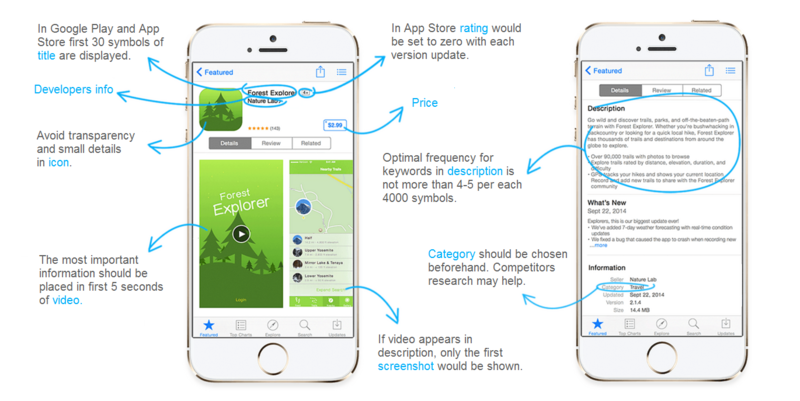 This set of methods is called App Store Optimization (ASO) and today we are going to explain it in details. What is in common between ASO and SEO? SEO optimizers are aiming to improve a site to increase its rating in search results and make it bring more profit to its owner. The aim of ASO is to elevate positions of application in store rating according to key queries, as well as to increase number of organic installs after an app page view. Could I make ASO on my own, without additional cost? Yes, the main costs are related to different tracking services and graphical materials production. Of course, it is possible to use specialized agencies services, allocating separate budgets. In this case ASO budget could be compared to the one of PPC, but it is worthwhile: optimization of application page would bring organic search traffic even after ASO activities are paused or finished. How many free installs would I gain as a result? The share of organic (free) installs depends on application theme and intensity of efforts on other traffic channels. More-or-less accurate value of conversion rate growth could be obtained only through testing. On average, the percentage of organic installs and paid ones are rated as 70/30. It is not easy to forecast the growth of installs after basic ASO activities. It is possible to improve positions in rating of keyphrases, but at the same time mis-strike graphical elements (which directly affect conversion rate to install). It is possible to get additional traffic and installs in case of featuring on the main page of store or in categories catalog. The result would be significantly better in case of featuring on the store main page. Why should one care about organic installs? The advantage of organic installs lies in higher level of user loyalty. Those who have installed application using search are more interested in its regular usage. According to Netpeak experience, the share of comebacks within next days amongst such users is much higher than amongst those drawn by PPC. How do users search for applications in stores? In most cases users search using specific title or main keywords (phrases) that describe application functions. 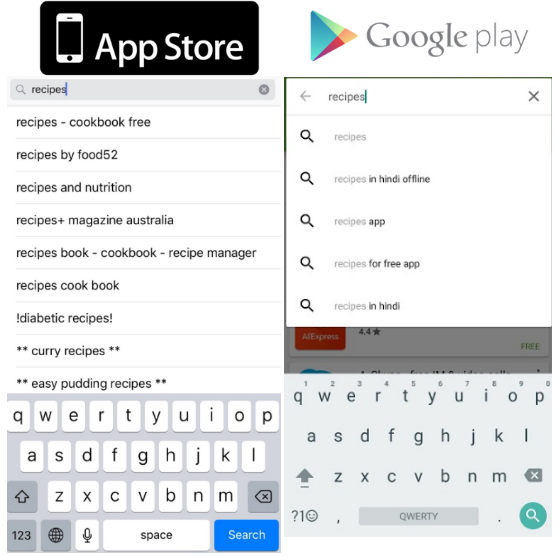 It is okay that apps are being searched depending on one or two keywords. While typing queries to search panel of App Store, one sees app titles that consist of query words, while in Google Play user observe search hints. 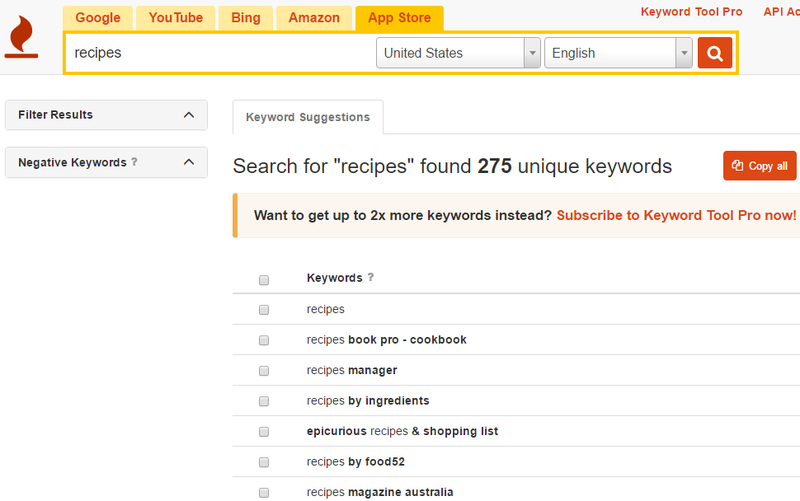 Examples of search hints for “recipes” query. Typo often happens while using mobile device keyboard. Though, algorithms of search take into account most of them, this point should be considered. How to optimize main elements of application page in Google Play and Apple App Store? Determination of main KPI before App Store Optimization activities. Audit of application + main competitors research. Performing A/B testing with different elements. On-page: what could be optimized? It is required to optimize text elements to improve positions of application. It could be done by adding relevant queries in app title, description, “keywords” field with up to 100 symbols for key queries (only for Apple App Store). All these elements are key rating factors in store's search results. App Store. Permitted length of title— 50 symbols. It should be taken into consideration that the maximum length of visible part in App Store is up to 30 symbols, while the rest of title is being cut off. Google Play recommends to limit title to 30 symbols, taking into consideration the visible part at the catalog page. Both stores use title as a key factor of ranging, therefore top priority key queries should be placed closer to title beginning. Text field, which is displayed until “More”. Maximum length — 80 symbols. Core idea of an app should be described here, taking into account key queries. Within App Store, description is restricted with 4000 symbols and is not considered to be a rating factor. Advice: a well thought-out text should be prepared to attract user, which have gone as far to read it, while investigating app page in search results. N.B! The visible part of text until “More” button (which gives full description) is approximately 360 symbols long (three lines, 120 symbols each). Line with text, according to the first point. In this case, description would look better than straight text, even an entertaining one. In Google Play, full description counts as rating factors. The text limit is 4000 symbols. The ideal keywords frequency is no more than 4-5 per 4000 symbols. It is important not to overdo here, as because of too many keywords application may not get in search results at all. Information on main queries for promotion should be placed in first 167 symbols of description. This field should contain no more than 100 symbols. It could be specified in app account in iTunes Connect, for ordinary users in App Store search the content of this field is not available. all queries with coma, no spaces! queries should be arranged based on priority, starting from the most important (though there are many arguments regarding the importance of keywords order, we do recommend to make it this way, as tomorrow it may appear to be an important factor ;) ). It is important to choose the most relevant category. To choose wisely you need to be rational and to make competitors categories assay. 25 categories are available now in App Store (without subcategories) and 53 categories in Google Play, including subcategories “Games” and “For all family”. Let us recall that in July Google Play has added 8 new categories and changed titles for other two. 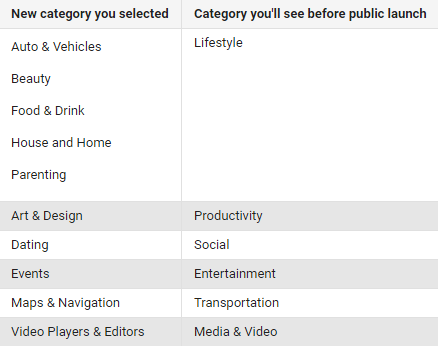 Changes in Google Play categories. That’s all to be done with the text. But it is not enough to solely be in TOP of catalogues list if you want users to press the desired “Install” button. The appearance of app in listing and the app page itself with details should evoke users' interest and desire to install it. In order to achieve it, the one should work on CRO from impressions to installs. Pay attention to graphic elements in the first place. Icon is an element that forms the first impression about application on the listing page. no photos or screenshots are allowed as icon. Screenshots box optimization is an effective way to improve conversion rate into installs. A user can observe app screen with device frame and text annotation — brief description of feature on the screen (it is possible to use queries that have been prepared in advance). App Store. Maximum number of screenshots — 5. First two are the most important, as they would be visible after landing on app page. If video is present in the description, only one screenshot would be visible. Google Play. Maximum number of screenshots — 8. It is important to use all available number of screenshots as well as creating the own set for each device size. Here is a lifehack for those, who want to create cool screenshots with device frame and annotation on their own: you are welcome to use these free generator programs: http://www.appstoreoptimization.io/ and http://theapplaunchpad.com/. Save required number of app screens for each store. Upload them to service, choose background, device frame, add annotation to screen and style in which it would be displayed. Download the package of screenshots for each device, ready for upload in iTunes Connect and Google Play. This method also fits for creating localized screens. App Store. Video duration should be 15-30 seconds. In App Store it is possible to add video for one localization only, therefore it is recommended to make video as animated promo about application usage. It is better not to use text caption in video — so that video would be more suitable for different countries. And don’t forget to choose the most attractive slide for preview. Google Play. The video duration should be from 30 seconds to 2 minutes. Its is possible to have a separate video for each language, supported by Google Play. All important information should be placed in first 5 seconds of video — it is the main rule for all platforms. Only a small part of users would watch full video. Video cover in App Store should hold a slide from video itself. For Google Play, any appropriate image will work. If your application is multiregional, it is required to localize app page elements: implement correctly translated titles, descriptions, keywords field, create a set of screenshots for each language. For localization, one should visit iTunes Connect and Google Play Developer Console, choose application and tick languages to be used in page adaptation. Next step is to fill in title, description and other information for a particular language. For App Store, it is possible to change some metadata, including new languages during the first download of IOS app version. Classic methods of semantic collection suit only partly, as frequency and phrases, which are used in web to search for information, do not always correspond to mobile search. It is recommended to start with making a list of words and phrases that you (and your friends) associate with application. And only then use special tools to analyse and expand query pool. Google Keyword Planner. One should pay attention to the frequency of mobile search queries. The only drawback in Keyword Planner work is that Google restricts precise information on queries frequency for those Adwords accounts, which do not have enough budgets for campaigns. From now on only information about frequency range would be available. But no need to panic! Accurate data could always be found in Serpstat (how-to do it ). Even after Google restrictions this service would keep on providing up-to-date information on queries frequency for desktop search. Keywordtool.io. In the free version basic collector for queries from titles in App Store is available, including language options and different regions of search. Keyword.io. 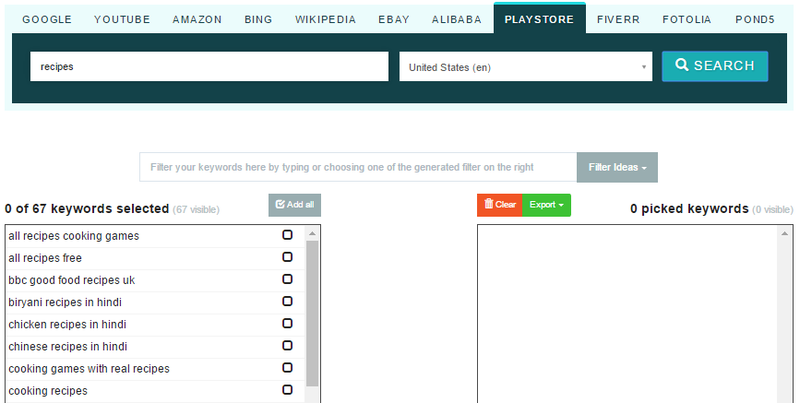 This tools suits for expanding a list of low frequency queries for Google Play in any country. An additional source of semantics that could be used of competitors key phrases analysis. It is possible to look through their titles and descriptions manually or monitor them in special services, such as AppAnnie, AppFollow, Mobile Action, ASODesk. There tools are more like tools, many of which propose free trial period. Off-page optimization: what could be optimized? Rating downgrade could drop positions in search and conversion rate to installs down. It is possible to set pop up window questioning user about application, but do not interfere with user app interaction, especially in an appropriate moment. It is best that pop up appears after user completed some action successfully. 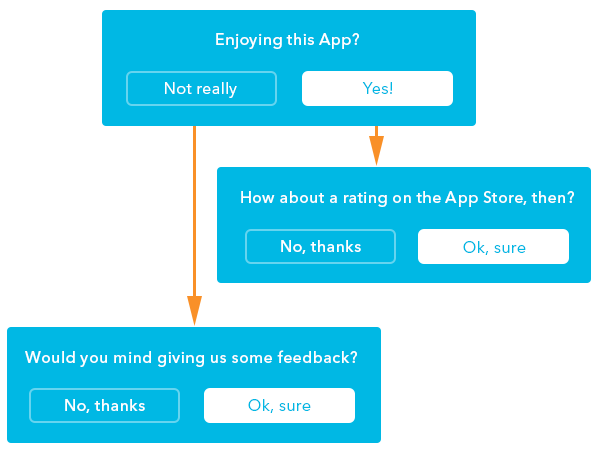 If the answer is positive, you can ask user to rate the application. In case the answer is negative, one should prompt the user to leave feedback (this way is better, than let the user leave this negative review). It is very important to use “question form”. Request to evaluate app annoys users more often and makes them bounce off. In Google Play it is possible to reply to reviews. We recommend to answer negative reviews as soon as possible — the author of review receives mail notification with developer’s reply. There is a real chance that user will give a higher score to an app. In App Store rating resets to zero every time a new app version is uploaded to store. Indexing of app content in search systems results could become an additional source of installations. Manual for setting up indexing for IOS and Android platforms could be found at Firebase App Indexing. By the way, one should have a closer look at the analytics of mobile apps with the help of Firebase. Apart from additional traffic from organic Google search there is a possibility that App Indexing would have positive effect on application rating. The page has been optimized. What's next? After basic app optimization has been performed and results have been measured, it is possible to start testing local changes in details. After each iteration of A/B test it is possible to track, what exactly improves visibility and conversion. According to our experience, potential growth of conversion rate after each A/B testing is possible around 15-45%. It is possible to use free testing tool integrated into Google Play Developer Console or other commercial tools, for instance SplitMetrics, which creates landing pages identical to application pages in store. External traffic should be redirected to this landing (not from search store). Do you need ideas for split-test? Replace screenshots, change the icon, add text formatting in description, choose another stop-frame for video. Define the most relevant key queries. Implement queries in text elements (title, description, keywords field). Optimize graphical elements (icon, screenshots, video). Set indexing of application content and deeplinking. Localize app for countries, which are important for promotion. Constantly test and measure results. You are welcomed to share your observations and cases in comments. In every step this setting is really important. Because this make the lots of growth in your efficency sync your settings and with this whole system you can save of your lots of time. Thank you for this essential post! This article explores all fundamental aspects of mobile app promotion. Hi! Your article is great because is full of specific, useful tips. I agree with you that app icon is important. A beautiful, identifiable and memorable logo can have a huge impact on the popularity and success of the app. This is the first thing that you see after a company name. I’ve just written an article on PressPad blog about mobile app promotion and I showed an example of mobile app which achieved over 10 000 downloads using all these tips. It is a very useful and in-depth article on promoting a mobile application, Valeriia. At ShowBox we focus mainly on organic ranking and high budget FB campaign that allow us to build the base of users and then it automatically goes viral by word of mouth. And yes thanks a lot for writing such amazing content.